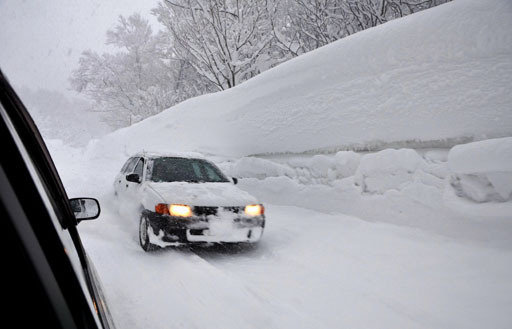 Communities in Hokkaido and five prefectures of the Tohoku region, we are told, have had record levels of accumulated snow as of 25 February. In the Sukayu district of Aomori city along the Hakkoda mountain range, the snowpile measured 5.61 metres, a record for all areas where the Japan Meteorological Agency keeps records of accumulated snowfall. Thirteen locations have set records for their snowpiles this winter. But this is not without cost. The death toll around the nation has hit 67, while 444 have been "badly wounded", according to the Fire and Disaster Management Agency (FDMA). Of the 67 deaths, 52 were citizens aged 65 and older. Japan, of course, is not alone. Baltimore is set for a two-year record. Chicago has experiencedrecord-breaking snowfall. Wednesday saw a total of 5.4 inches measured at Chicago O'Hare International Airport. This snowfall total makes the event the largest snowfall of the season for Chicago thus far, making up 28 percent of the 2012-2013 winter snowfall total. Southwest of the Windy City, a blizzard broke the all-time monthly snowfall record for Wichita, Kansas. The storm dropped nearly seven inches of snow on that city, bringing the monthly total to 21 inches — the most snow the city has seen in any month since records have been kept, according to the National Weather Service. These were just a tiny few of the records broken, in a winter that had 652 records set in the US, with snow as far south as the Mexican border in Arizona. But we've also seen a French resort - Cauterets, in the Pyrenees - overtaken the world record for snow at a ski resort, with a massive five metres of snow on the ground – enough to keep the slopes open for business until mid April. The quantity of snow this year has surprised everyone, and has its drawbacks. Some ski slopes being forced to close for safety reasons and sixty people currently working to clear the resort of the excess. No amount of clearance will sort out the Russian village of Oymyakon, which hit -70ºC this winter – the land that global warming forgot. But, with so much of the white stuff around, it is thus not a surprise that public concern about environmental issues including climate change has slumped to a 20-year low. Only 49 percent of people - according to the poll of 22,812 people in 22 countries including Britain and the US - now consider climate change a very serious issue – far fewer than at the beginning of the worldwide financial crisis in 2009. One reason for the relatively low ranking of climate change is that people often believed it did not directly affect them, says Tom W. Smith, Director of the General Social Survey. But then it could also be that people can see for themselves that the greenie propaganda doesn't stand up. With "global warming" readily seen as an ironic synonym for snow, the warmists are losing the game.